Facebook is finally launching local Deals – a new and innovative feature that will compete with Groupon‘s core product, not Foursquare’s – in five cities starting Tuesday. The five communities in question are San Francisco, Austin, Dallas, Atlanta and San Diego. Facebook revealed to The New York Times that the local offers made to Deals users will be delivered via email and will also appear in users’ news feeds. 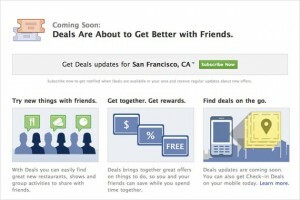 Any Facebook user can sign up for Deals notifications on the feature’s landing page now; users in the five test cities will be able to see and use Deals within a few hours of the writing of this post. Facebook’s first local deals product was announced as part of Facebook’s overarching locations feature, Places. Mobile check-ins were linked to deals; in this way, Deals served as an reason for Facebook users to integrate Facebook Places in their daily lives – and they were also an reason for marketers and major brands to put more money into the Facebook platform. 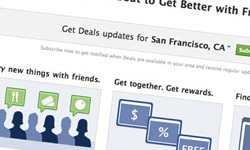 Facebook even briefly launched a page to let web users find these checkin-focused deals on the web. Perhaps most importantly, users will be able to buy Deals using Facebook Credits. We suspected Facebook had plans to bring Credits to the real world since around the time of f8, the company’s developer conference, when Facebook announced its ambitious and determinedOpen Graph. Users will also be able to buy Deals with major credit cards.